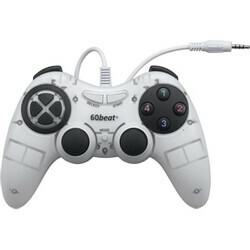 No, this isn't a controller made for the nex-gen PlayStation or Xbox video game consoles. In fact, what you see is a gaming accessory tailored specifically for iOS devices. Designed by a company called 60beat, it works with the iPhone, iPad, and iPod touch. But while gaming accessories for smartphones and tablets we have seen a lot of, this one has a special trick up its sleeve. It connects to your portable iDevice via its 3.5-millimeter headphone jack, meaning that it requires no batteries to operate. At the same time, it is a full-fledged video game controller with a d-pad, two analog sticks, and ten action buttons. And it works with virtually no delay, so you can have total control over the action even in the most dynamic of video games. However, while we can't deny that the 60beat game pad looks quite cool, useful, and practical, there are a few things that one must consider before taking out their credit card. First of all, it is priced at $50, so if you are not that big of a gamer, perhaps you can do without it. Besides, it is fully compatible with only two video games, so there is no guarantee that all of its capabilities will be usable while playing the titles that you own. Luckily, full support for more video games is promised to come in the near future. For more details, the press release is embedded below, along with a short video demonstrating the 60beat game controller in action. New Britain CT, December 2011 – With proprietary technology that uses the headphone jack as the interface, the 60beat® GamePad significantly improves the IOS gaming experience by moving the controls from the screen to a fully-featured hand-held game controller. Developed to look, feel and operate like widely-used external controllers, GamePad easily and instantly transforms an iPad®, iPhone® or iPod touch® into a game console. The ergonomic design delivers superior comfort and control. Buttons and joysticks are engineered to deliver precise response and the tactile sensations gamers expect. it does look nice, but for that price I would rather buy OnLive controller. Cool concept..how about some bluetooth controllers for android?